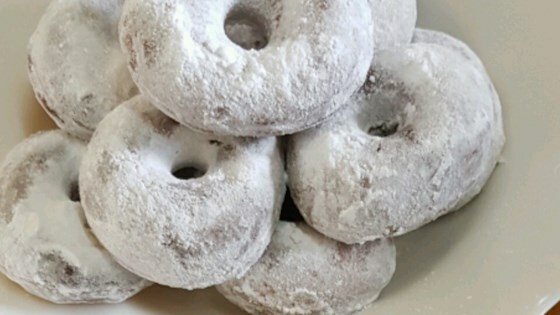 "These light and airy doughnuts make a terrific treat for the holidays. You may dip them in chocolate glaze or add candy sprinkles if you wish." In a large mixing bowl combine 1 3/4 cups flour with yeast. In a saucepan heat milk, sugar, butter and salt until butter melts. Stir milk mixture into flour along with eggs, beating with a heavy-duty electric mixer on low for 30 seconds, just to combine. Increase speed to high and beat 3 minutes. Add the remaining flour, a little at a time, stirring with a spoon to make a firm but pliable dough. Knead dough on lightly-floured work surface 4 to 5 minutes until smooth and supple. Transfer to an oiled bowl. Cover and let dough rise until it doubles in size, about 1 hour. Turn dough out onto floured surface, punch down and roll out to 1 /2- inch thickness. Cut out doughnuts with a floured doughnut cutter; re roll trimmings and cut them into doughnuts as well. Transfer doughnuts to baking sheets, cover and let rise 45 minutes. Heat oil in a deep-fryer to 360 degrees F (180 degrees C). Fry doughnuts, in batches, turning several times, until golden all over. Using a slotted spoon remove doughnuts to a rack to drain. Let doughnuts cool and dredge in confectioners' sugar. I followed directions perfectly and waited 3 hours for the dough to rise. Never did. Will throw this recipe out. Never will try this one again. It does not even rate a 1 star. The recipe did not rise. Someone might happen get some good results possibly from this, but very bad directions.